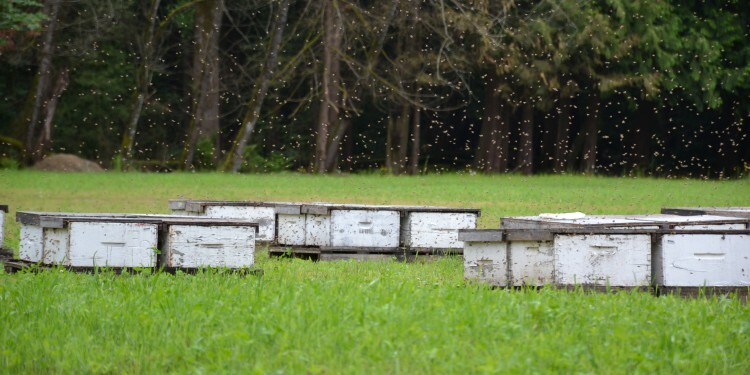 Approximately three or four hives are required per acre. Spring was an uncertain time for Lower Mainland blueberry growers. 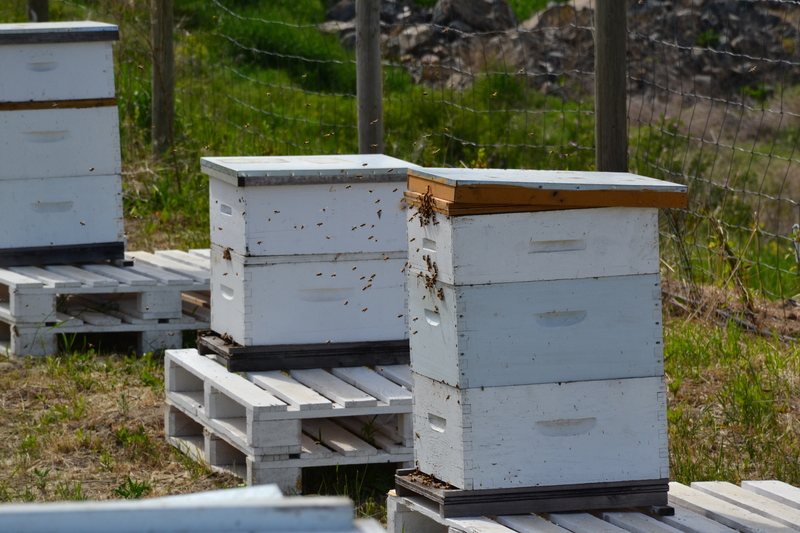 Reports that Alberta beekeepers wouldn’t send bees to the region had growers thinking yields would be greatly impacted. Frank Schimunek, farm manager with Honey Bee Centre, notes there aren’t enough beekeepers in the Lower Mainland to accommodate blueberry producers. The synergy of Alberta’s apiarists pollinating BC blueberries has previously been favourable. 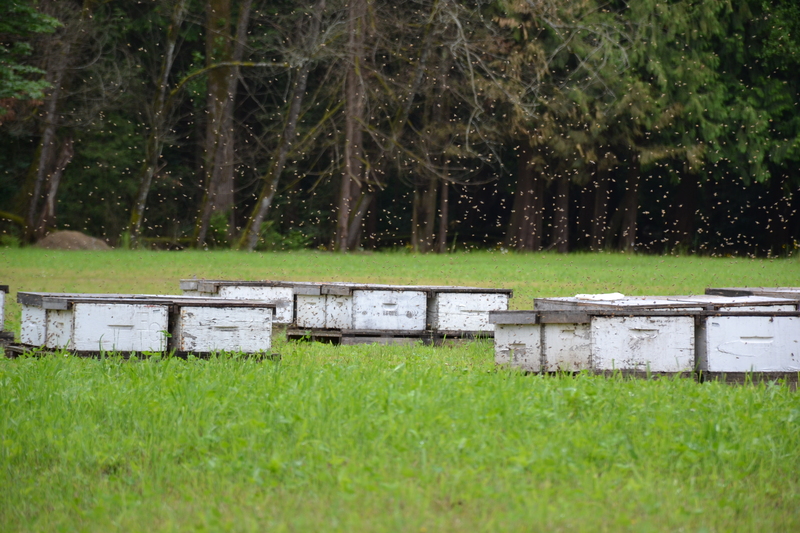 With BC’s milder climate, the hives are able to build up their strength more quickly after overwintering. Without bringing the bees to BC, Alberta apiarists would wait another two or so months, plus they would miss out on revenues from pollination services and increased honey production. It was last year’s weakened bees that caused concern among beekeepers. The bees weren’t able to pollinate northern crops well enough to create the usual volume of honey. It was last year’s weakened bees that caused concern among beekeepers. The reduced performance of bees when they returned to Alberta was likely from a variety of issues. The weather, chemical application, lack of pollen build-up in the bees before hitting the fields, foulbrood, other diseases and simply a bad year may all have contributed. Last year, there were only about eight flying days for bees, he says. It was a disappointment for growers with reduced yields and for beekeepers with weakened hives and a lower volume of honey. Jack Bates, BC Blueberry Council chair, notes things got out of hand with the increasing reports of beekeepers not coming to the Lower Mainland. Some apiarists received a higher than average price for their services as a result. While fears ended up being much ado about nothing, it certainly sent a level of awareness through growers as to managing pollination needs. As Bates explains, approximately three or four hives are required per acre. Without pollination, blueberries don’t happen, but blueberries can’t be a bee’s only diet. “Blueberry pollen itself is lacking in some of the nutrition bees need, so there’s a lot of discussion around how to supplement,” Schimunek says. By providing more forage for bees, hive health increases and compensates for the nutrients that are lacking. “Some blueberry growers recognize that there are not enough natural pollinators,” he notes. Natural pollinators like bumblebees may be more efficient in their efforts, but there are fewer of them. Honeybees make up for their less efficient work with the large numbers per hive. “Bumblebees actually fly when it’s raining and even when it’s as low as 10 degrees, but there’re just not enough of them around,” says Schimunek. This year was much more favourable for honeybees with Schimunek estimating 25 flying days. He feels the results for blueberry growers will be equally positive in terms of yield, which Bates agrees with. As is the case with the bees, blueberry yields are determined by a variety of factors and some fields had patches of frost damage which no bee can overcome. As for the use of pesticides, fungicides and herbicides, the majority of growers are concerned about bee health. “We worked with 100 blueberry growers and most of them are very conscientious of the bees,” Schimunek says. While most growers won’t spray pesticides during pollination season, some will spray fungicides or herbicides at night (when bees aren’t flying), but it’s not known how this actually impacts bees. Some feel that any chemical sprays (during pollination or not) are absorbed into the plants themselves and the water, eventually finding their way back to bee colonies. The BC Ministry of Agriculture began a study during flowering season to explore the effects of fungicides on bees in blueberries. There are ways for growers to enhance honeybee health and that of native pollinators. 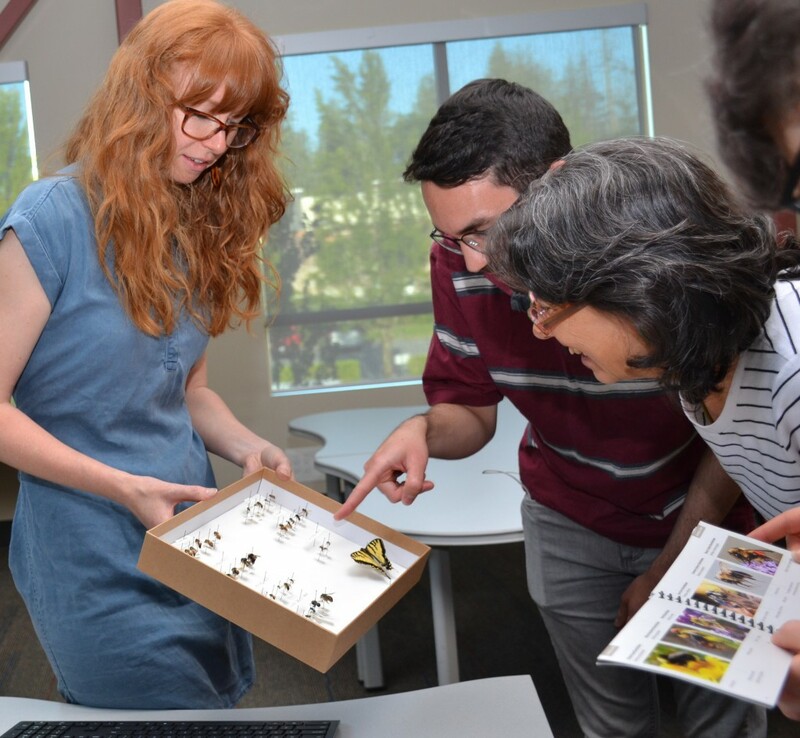 The Langley Environmental Partners Society brought pollination educator Erin Udal to the organization’s spring AGM to discuss health and well-being of pollinators. While the majority of people logically think of honeybees when it comes to pollination, the world of pollinators is actually much larger. Hummingbirds, butterflies, bats (though not in BC) and beetles also pollinate. While there may not be enough of these pollinators to manage the needs of blueberry growers, helping them flourish will make a positive difference to yields and may help offset any future honeybee shortages. Bees are the only active pollinators in that they purposefully collect pollen, whereas other pollinators collect pollen accidentally. Udal notes that bees are considered a keystone species, meaning the ecosystem around bees would go through upheaval if they were eliminated. Not native to Canada, honeybees were brought here around the 16th century primarily for beeswax, presumably for candles. They are the only bee that produces honey, other than the bumblebee, which generates an amount too small to be harvested by humans. Bees are usually classified in three categories based on where they nest. Ground nesters (mining bees, Colletes bees) tend to be solitary (there is no large hive and the female high-tails it out of the nest after laying eggs); although the bees may nest together in small numbers after hatching and are great at pollinating crops like blueberries, apples and other fruit. Ground nesters like sandy soil and their homes may look like an ant hole. The second type of nest is a cavity nest, like that of a mason bee or a leafcutter bee. These bees are active in summer months, pollinate fruits and vegetables and like ground-nesting bees are defined as solitary. The third category of bees is recycled nesters. This group includes bumblebees because they are unable to create their own nests. Recycled nesters like long grass and compost piles because of the warmth and security. These are bees farmers definitely want to encourage. This type of pollination releases stubborn pollen that other bees can’t access making them very efficient with blueberries and cranberries. Udal advises farmers to keep a few undisturbed areas around fields to accommodate the bees and to avoid mulching these areas to encourage their habitat and homes. The best way to naturally encourage pollinators is to create or maintain habitat for them. This will also supplement honeybee diets when they are in blueberry fields. Udal explains that mono-crop fields are a “nutritional desert” for bees outside of the two-or-so weeks of bloom. She suggests red flowering currant, salmon berry, ocean spray, lupin, clover and alyssum as bee-attracting plants. Preservation doesn’t have to take much space to be effective. Udal points to a case where farmers turned a tenth of their land into a diverse pollinator oasis. The end result was an increase in yield that more than compensated for the land removed from cultivation. Taking care of native bees will help offset any future fears of lack of pollination. Plus, by maintaining positive diverse habitats for all pollinators, all bees will be stronger and healthier.